I keep thinking about posting, and not posting. Being back from vacation has been a trifle tumultuous, if not tumultuous in events, at least tumultuous in my brain. Lots going on, lots to organize and think through and decipher, and it’s been tiring. 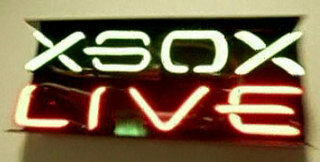 One of the things I sorted through this past weekend was setting up Xbox Live on my new 360. In some places it was a bigger pain than expected, and in some places it was far easier than expected. For example, getting my 360 to communicate to Live was a Big Pain. I couldn’t get the Wi-fi to work. And then I realized my Linksys WET11 ethernet bridge was not seeing my network because I’d changed its SSID. So I fixed that and it still couldn’t find it. Then I recalled that I was having some trouble connecting from my laptop, too. So I started up my little Netgear travel router, and both the WET11 and my laptop connected to that with no problem. Hm. Incidentally, that travel router – that thing rocks. We used it on the round-the-world trip, and in most hotels I was able to get it up and running without too much hassle, so we could surf the net wirelessly from bed. An excellent buy for the road warriors among you. Next step was to install the HyperWRT third-party firmware to my Netgear WRT54GS router, which let me turn the Wi-fi signal up from 50% to 83%. That seemed to fix the connection problem. Okay, try to connect from WET11, no problem! Whew. So now Live could see that I had a network, but couldn’t get anywhere. Setting the IP addresses of the WET11 and the 360 to static IPs fixed that problem – having the 360 pull its IP from DHCP seemed to be a real issue. Then setting the DNS to static addresses as well finally let me connect my poor lonely 360 to its mothership. Whew. So now the 360 could get to Live. Converting my account over to a 360-compatible account was painless. Nice! Setting up Media Connect so that my 360 could read files from the PC didn’t quite go as planned – it errored out on the PC several times, but then ultimately worked anyway. Not sure what is up with that. So, so far the actual experience of setting up Live had not been TOO painful; mostly all the problems I had were networking problems of my own. Although, admittedly, anyone who was not network savvy would have been banging their head against the wall at multiple points in this process. Finally last night I was able to try Live out. I had three games: Project Gotham Racing 3, Madden 2006, and Call of Duty 2. Project Gotham Racing 3: How the heck does one start up a multiplayer game? This was totally confusing. We wanted to set up a game and then have other players join it, but it’s not done through in-game menus. Rather, you have to bounce out to Live and invite people from the Live interface. Okay, once we’d determined that, we were in good shape. But it was totally confusing that a bunch of multiplayer options are resident in the game interface, while others are only accessible from the Live blade. Ultimately, PGR3 ran incredibly well and we had the best experience of these three games playing it over Live. However, my VOIP session completely fell apart into digital garbage after just a couple minutes, and became unuseable. I haven’t puzzled that one out yet – we just defaulted to using cell phones to talk while playing. Call of Duty 2: This was the biggest disappointment of all. The single player game for COD2? Fun as hell. But over Live? Completely unplayable. First of all, it was incredibly difficult for us to figure out how to create a game that we could play together, as opposed to just doing a “quick match” with random people. But then when we did manage to put a match together, the lag was so horrible that we couldn’t play it. So at this point in our playing the VOIP was screwed up *and* the game was majorly laggy. That just reinforced for me that I’d rather go play COD2 on my PC, anyway! So out of three games, after a bit of headache setting up Live, only PGR3 was a hit. The VOIP wasn’t working properly, and one game had severe lag. All in all not the best experience out of the box. That said, the Media Connect stuff on the 360 worked great, although I wish it had video support and that the XP software didn’t spin my HD and CPU so much, even when it’s not in use. I guess I’m going to have to buy the native 360 wifi device to see if that helps with the lag. That’s sure annoying though, as the WET11 worked just fine on the original Xbox.